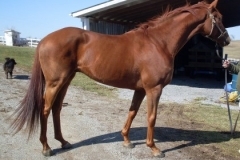 Wise Young Sage was purchased as a Prospect Horse on the Bits & Bytes Farm Web site in May of 2009. People literally stare at Wise Young Sage's beautiful floating trot & rocking horse canter. He has amazing potential to be competitive at the highest levels in eventing. 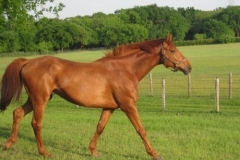 Wise Young Sage was sold as a Prospect Horse For Sale from the Bits & Bytes Farm Web site in June 2009 to Mimi Falb of San Antonio, Texas. 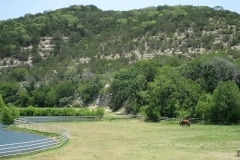 Wise Young Sage finally arrives at his new home in San Antonio, Texas to start his sport horse career as an event horse with Mimi Falb.